How Is Cast Iron Used in Architecture? What's the Difference Between Cast Iron and Wrought Iron? Cast-iron architecture was a popular type of building design used throughout the world in the mid-1800s. Its popularity was due, in part, to its efficiency and cost-effectiveness — a regal exterior facade could be mass-produced inexpensively with cast iron. Entire structures could be prefabricated and shipped around the world as "portable iron houses." 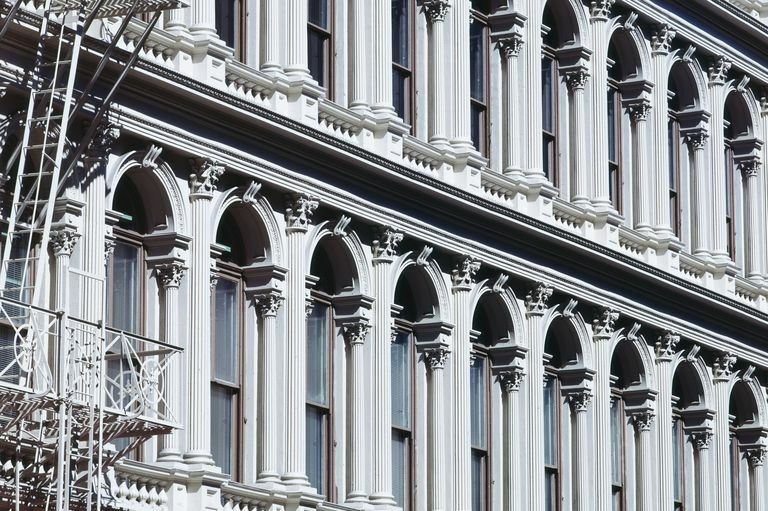 Ornate facades could be imitated from historic buildings and then "hung" on the steel-framed tall buildings — the new architecture being built in the late 19th century. Examples of cast iron architecture can be found in both commercial buildings and private residences. Preservation of this architectural detail has been addressed in Preservation Brief 27, National Park Service, U.S. Department of the Interior — The Maintenance and Repair of Architectural Cast Iron by John G. Waite, AIA. Iron is a soft, natural element in our environment. Elements like carbon can be added to iron to create other compounds, including steel. The properties and uses of iron change as different element proportions are combined with various heat intensities — the two key components are mixture proportions and how hot you can get a furnace. Wrought iron has a low carbon content, which makes it pliable when heated in a forge — it is easily "wrought" or worked on by a hammer to shape it. Wrought iron fencing was popular in the mid-1800s as it is today. The innovative Spanish architect Antoni Gaudí used decorative wrought iron in and on many of his buildings. A type of wrought iron called puddled iron was used to construct the Eiffel Tower. Cast iron, on the other hand, has a higher carbon content, which allows it to liquify at high temperatures. The liquid iron can be "cast" or poured into prefabricated molds. When the cast iron is cooled, it hardens. The mold is removed, and the cast iron has taken the shape of the mold. Molds can be reused, so cast-iron building modules can be mass produced, unlike hammered wrought iron. In the Victorian Era, highly elaborate cast-iron garden fountains became affordable for even a rural town's public space. In the U.S., the fountain designed by Frederic Auguste Bartholdi may be the most famous — in Washington, D.C. it's known as Bartholdi's Fountain. Cast iron was used in both commercial buildings and private residences for many reasons. First, it was an inexpensive means to reproduce ornate facades, such as Gothic, Classical, and Italianate, which became the most popular designs imitated. The grand architecture, symbolic of prosperity, became affordable when mass-produced. Cast iron molds could be reused, allowing for the development of architectural catalogs of module patterns that could be optioned to prospective clients — catalogs of cast-iron facades were as common as catalogs of pattern house kits. Like mass-produced automobiles, cast-iron facades would have "parts" to easily repair broken or weathered components, if the mold still existed. Second, like other products mass produced, elaborate designs could be assembled rapidly on a construction site. Better yet, entire buildings could be constructed in one place and shipped all over the world - prefabrication enabled portability. Lastly, the use of cast iron was a natural extension of the Industrial Revolution. The use of steel frames in commercial buidlings allowed a more open floor plan design, with space to accommodate larger windows suitable for commerce. The cast-iron facades were really like icing on a cake. That icing, however, was also thought to be fireproof — a new type of building construction to address the new fire regulations after devastating fires like the Great Chicago fire of 1871.
Who Is Known for Working in Cast Iron? The history of cast iron's use in America begins in the British Isles. Abraham Darby (1678-1717) is said to be the first to develop a new furnace in Britain's Severn Valley that allowed his grandson, Abraham Darby III, to build the first iron bridge in 1779. Sir William Fairbairn (1789-1874), a Scottish engineer, is thought to be the first to prefabricate a flour mill in iron and ship it to Turkey around 1840. Sir Joseph Paxton (1803–1865), an English landscaper, designed the Crystal Palace in cast iron, wrought iron, and glass for the Great World Exhibition of 1851. In the United States, James Bogardus (1800-1874) is the self-described originator and patent-holder for cast-iron buildings, including 85 Leonard Street and 254 Canal Street both in New York City. Daniel D. Badger (1806–1884) was the marketing entrepreneur. Badger's Illustrated Catalogue of Cast-Iron Architecture, 1865, is available as a 1982 Dover Publication, and a public domain version can be found online at the Internet Library. Badger's Architectural Iron Works company is responsible for many portable iron buildings and lower Manhattan facades, including the E.V. Haughwout Building. Paul Goldberger, Why Architecture Matters, 2009, pp. 101, 102, 210.